In September, I interviewed Neil Lamb, PhD, Vice President for Educational Outreach at the HudsonAlpha Institute for Biotechnology, about his career trajectory, favorite resources, and current projects. Kate: Tell us about your position and how it fits into your institution and its goals. Neil: HudsonAlpha is a non-profit organization in Huntsville, Alabama, that focuses on using genomics to improve human health and global sustainability. My team’s mandate is to create a more genomically literate society and to foster the development of the next generation workforce in Alabama. Our efforts encompass many different activities including teacher training workshops, the development of educational kits, courses and seminars on biotechnology for the greater Huntsville community, and even the development of educational apps. I work with an incredible team that makes this all happen, and these programs reached 1.5 million people during the last school year. Kate: What have been some of the biggest surprises to you about working with your state government? Do you have any advice about working with non-scientists in these types of situations? Neil: The biggest and most pleasant surprise has been how engaged people are about genomics. No matter what level I’m working at, many people are beginning to recognize its importance, and they all want to know more. This curiosity is a great starting point, and it means we can easily find a talking point that interests people and use that as a springboard. When talking with non-scientists, look for an area of common interest between what you’re doing and what interests the person you’re talking to. You might have to talk about multiple things until you see that light of recognition. When you do find an area of common ground, grab onto it and use it as a point of reference to start making connections. It’s important to keep your conversation as free of jargon as possible, at least when you start. We are so used to the detailed language we use with our peers, it’s hard to take a step back and have a more general conversation, but it is so important to have people walk away understanding the importance of your work and the help you need, that you really must put it in terms they can grasp. If you want to talk to someone about a very specific topic, walk them into that content by scaffolding it to something they already know and understand. It’s very difficult for somebody to internalize new knowledge if they can’t tie it to something they already know. I believe that when you use public funding for your science, you have an obligation to explain to the public what it’s about. And this community outreach aspect was very important to the founders of HudsonAlpha, so I have the support of the larger organization in this. Kate: How did your previous experience lead you to this job? Neil: I look back at everything from my graduate training on, and each of those things prepared me for what I’m doing now. My graduate training and time on the faculty at Emory gave me an understanding of the field, the language, and the vocabulary I have needed. After my PhD, I spent two years working at a church doing communications work and outreach to families, which gave me the comfort and confidence to step into challenging conversations in a sensitive way and to talk about science to non-scientists. While at Emory, I directed a research-based DNA testing lab, which gave me familiarity with the tools, instrumentation, and challenges of DNA variant detection and interpretation. I also taught medical students at Emory, which confirmed my passion for teaching and emphasized to me that I’m a much stronger educator than a research scientist. This recognition helped with the shift in my career. All of these experiences help me, as VP of Educational Outreach, talk about complicated topics that are often fraught with emotional and ethical issues to a broad range of individuals. They’ve helped me find the right analogies and language, and really translate science going on here and elsewhere into tools, applications, and experiences that engage students, teachers, clinicians, and the public. What I do today, I could not have done without the skills I learned at each of those previous jobs. Kate: What are your favorite genetics websites and resources? For K-12 stuff that I recommend for students and educators, I’m a really big fan of learn.genetics out of Salt Lake City and Genome: Unlocking Life’s Code, which was developed with NHGRI for an exhibit and whose website has ongoing content and resources. Kate: What are you currently reading/thinking about/working on? Neil: We are putting an intentional emphasis on bioinformatics and computation. We are working on a project with two- and four-year schools across Alabama where students will be computationally modeling the impact of DNA variants that we are identifying in patient populations here at HudsonAlpha. We are trying to help undergraduates learn some of the concepts and tools around genomics, including bioinformatics tools and comparative genomics, so it’s going to be fun to watch how that evolves. At the high school level, the state of Alabama has a number of projects underway to help celebrate the state’s bicentennial in 2019, and we have one project called “Bicentennial Barcoding”. We are working with high school classrooms across the state in partnership with wildlife preserves, nature centers, botanical gardens, and communities to identify native Alabama plants and then DNA barcode them. We want students to recognize the rich diversity of plant life in the state and to think about ways to protect it, and then we want to tie genetics, biotechnology, and computation to it to give them a different angle to look at those plants. These are just a couple of many projects they we have going on right now. They are great ways to look at how we can push what we do here at HudsonAlpha out into the community and really build excitement and enthusiasm in lots of places across the state. Kate: What everyday thing are you better at than everyone else? What’s your superpower? Neil: My superpower is communicating complex topics in an easy to understand way. That is the essence of who I am. There are a lot of things that I am not, but being able to communicate things in a way that people say “Oh, I get that!” – I’m really good at that, and I think that’s why this job at HudsonAlpha is a great job for me. It’s all about taking the science and its applications and finding ways to tell those concepts, tell those stories, so that people say “Wow! That’s cool!” or “Wait, that’s a job I could consider?” or “Now I understand that soundbite I heard on the radio”. Kate: I would go one further and say that one of your other superpowers is getting people excited about this stuff. It’s not just the language you use, it’s also that you do it in such a way that I can see how excited you are and that makes me excited about it too. Neil: One of my team’s philosophies is to think about how we can create sparks that ignite somebody else’s enthusiasm or love of learning or desire to want to know more. Neil Lamb, PhD, is Vice President for Educational Outreach at the HudsonAlpha Institute for Biotechnology. He has been a member of ASHG since 2000, served on its Information & Education Committee from 2003-05, and chaired the I&E Committee from 2007-09. Achieving work-life balance as a scientist is hard; the hours are long and can be unpredictable. Here’s some advice from Gail Jarvik, a member of ASHG’s Board of Directors, a physician and statistical geneticist at the University of Washington, and Head of the Division of Medical Genetics at UW. Elisabeth: You are a clinician, researcher, administrator, and your work requires a lot of traveling. You are also married with three children. How? Gail: It can be done. It helps to be very organized. I also have a supportive spouse who introduced me to the concept of getting as much help as we could afford when our family was young. His parents were both academics and he was well-trained from watching how they made it work. I had never had a housekeeper. That was his idea—even before we had children. Elisabeth: How old are your children now? Gail: Our children are now 22, 20, and 14 years old. At this point, only our 14-year-old takes substantial time. However, aging parents are beginning to take more time. Elisabeth: How did you adjust your work when you first had children? Gail: I went into the office early in the morning. You can get a lot done before everyone else shows up. At that time, I stayed off email from 7 until 9 AM. It allowed me to focus without distraction. I would work for a couple more hours after the kids were in bed at night. It is a real advantage to be a statistical geneticist. I have always been able to work very productively from home. Elisabeth: How did you arrange childcare? Gail: Unfortunately, the Seattle area does not have great childcare options. My husband is also a physician-scientist, so we needed flexible help. We have had live-out nannies for 22 years now. We have treated this as professional positions with a vacation, sick days, and health and unemployment insurance. There have definitely been some challenges, but our current nanny has worked with us for 14 years. We know she truly loves our kids. Elisabeth: Did you work on weekends? Gail: Of course, but for the most part I have been able to work from home. Gail: Not too many. Or, at least, not very many that I recall. I was able to volunteer one half day a week at my children’s grade school for many years. For the most part my schedule was flexible enough to be at recitals, performances, games, etc. I limited traveling when my first two children were young. I did finish a grant at the hospital while in labor. It was my project in a larger PO1 competitive renewal, so it had to get done. The baby was early. The grant was on time and it was funded. Gail: It all works somehow. You do not need to do all of it yourself. I had to learn how to accept help from both professionals and friends. Final advice: it is OK to bring store-bought food to the school potluck. Gail Jarvik, MD, PhD, is the Arno G. Motulsky Endowed Chair in Medicine, Joint Professor of Medicine and Genome Sciences, and Head of the Division of Medical Genetics at the University of Washington. She is also an Adjunct Professor of Epidemiology at the UW Medical Center and an Affiliate Member of the Fred Hutchinson Cancer Research Center. A longtime member of ASHG, she served on its Program Committee from 2009-12 and has been a Board member since 2015. We sat down with ASHG member Kathryn (Kate) Garber, PhD, to learn more about her unusual, three-part job and how she keeps up with it all (hint: superpowers are involved). Kate: I have three main pieces to my job: teaching, working in a clinical genetic testing lab, and writing for The American Journal of Human Genetics (AJHG). The typical tenure-track academic job wasn’t right for me, but I love academia, and I’ve managed to evolve my job into something that suits me and that fills a niche in our department. Emory has a medical school and training programs for physician assistants and genetic counselors, and all of these students are required to learn human genetics during their training. I have been involved in the design and implementation of each of these programs, and I teach in all three every semester. As I’ve gained more experience, I’ve also been involved in oversight of the medical school program, which has been a great learning opportunity for me. In the clinical genetic testing lab, I am a variant analyst, which means that I classify DNA sequence variation as being pathogenic (disease-causing) or not before it is reported back to the ordering physician and patient. I also respond to clients who have questions about a variant classification and regularly discuss our classifications with other testing laboratories to help ensure consistency between labs. This job involves a lot of computer work and reading, and I’m constantly learning about new genes and new conditions. To me, it feels like solving puzzles, and I find it very interesting. Finally, I write a monthly column called “This Month in Genetics” for AJHG. I scan the literature each month to find articles that I think will be of interest to the human genetics community, and then I write a short summary for each. Although sometimes it feels like the deadlines come faster and faster, I can’t think of a better opportunity to stay widely-read and to work on my writing skills. Some of my favorite days are spent scanning tables of contents looking for papers that catch my eye. Although translating that excitement into a few short sentences can be tricky, it is great practice for me in delivering complex information succinctly. Kate: My work with AJHG really helps with that! But I also use GenomeWeb to monitor what’s going on. Attending seminars on a wide variety of topics is also something I find valuable, particularly for keeping up with techniques. Kate: OMIM (Online Mendelian Inheritance in Man) and GeneReviews. Both are go-to websites for me on a daily basis. OMIM does such a great job summarizing the literature on disease genes and is a quick reference for inheritance patterns and to find the phenotype associated with a gene. GeneReviews is a great place to find overviews written by experts that summarize clinically relevant information for a variety of genetic conditions. Both are extremely valuable sources of information for the work that I do. Kate: Chromatin domains and other higher order ways to control genes. And because of some of my classes, I’ve been thinking a lot about the latest and greatest treatment strategies for genetic disease, such as RNA-based therapies and gene therapy. Kate: It’s not a broadly applicable skill, but useful for a geneticist: drawing pedigrees in PowerPoint. Kathryn (Kate) Garber, PhD, is an Associate Professor at Emory University and Chair of the ASHG Communications Committee. 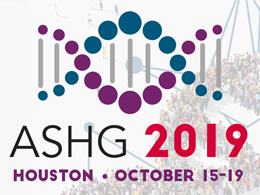 She has been a member of ASHG since 2007.